Zbor cu parapanta Brasov. 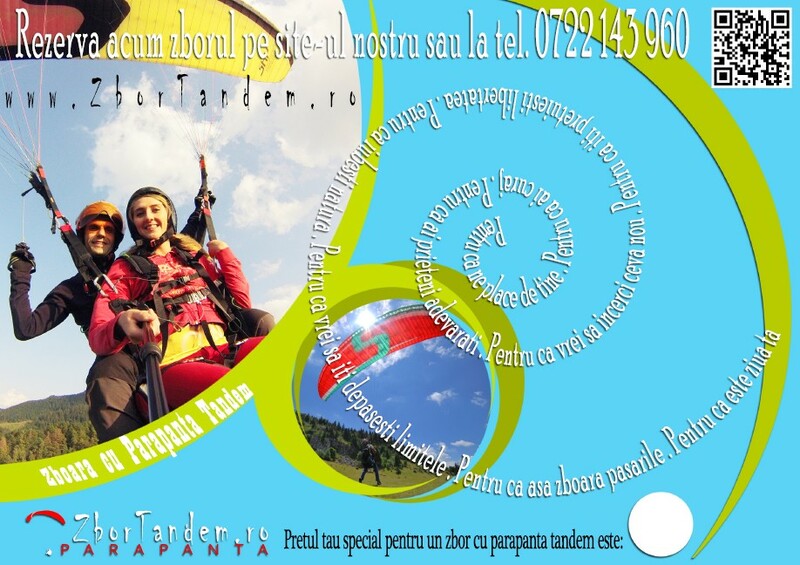 Paragliding tandem flights. Yes, if you have a drop of courage, paragliding is also for you ! You will be rewarded with great landscapes, lots of adrenaline and memories you will not easily forget. Despite common beliefs, paragliding is a safe sport. It has rules, licences and even competitions, and by following some basic rules is a rather secure sport. In paragliding we do not jump, or fall not even at the take off (this is normally done on a grassy slope) and you will need to run just a few steps at the take off and landing. We are depending 100% on the weather, so in case you already made your reservation, we will need to re-confirm it with 24-48 hours before the flight. There is not an age limit for this sport, but we do have a weight limit: 25-100 kg !